Does Lithium Exert an Independent Antisuicidal Effect? Aim of study: Recent investigations have indicated that adequate lithium treatment lowers the suicide mortality associated with affective illness. 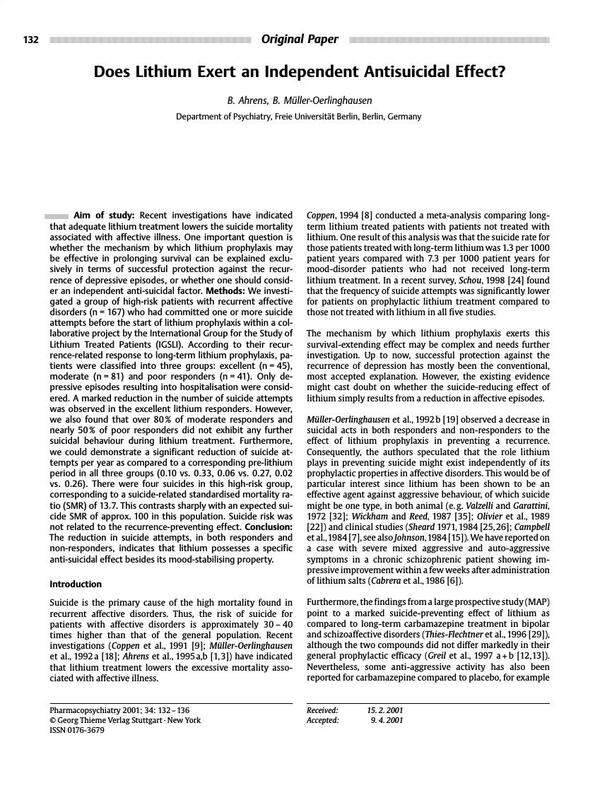 One important question is whether the mechanism by which lithium prophylaxis may be effective in prolonging survival can be explained exclusively in terms of successful protection against the recurrence of depressive episodes, or whether one should consider an independent anti-suicidal factor. Methods: We investigated a group of high-risk patients with recurrent affective disorders (n = 167) who had committed one or more suicide attempts before the start of lithium prophylaxis within a collaborative project by the International Group for the Study of Lithium Treated Patients (IGSLI). According to their recurrence-related response to long-term lithium prophylaxis, patients were classified into three groups: excellent (n = 45), moderate (n = 81) and poor responders (n = 41). Only depressive episodes resulting into hospitalisation were considered. A marked reduction in the number of suicide attempts was observed in the excellent lithium responders. However, we also found that over 80 % of moderate responders and nearly 50 % of poor responders did not exhibit any further suicidal behaviour during lithium treatment. Furthermore, we could demonstrate a significant reduction of suicide attempts per year as compared to a corresponding pre-lithium period in all three groups (0.10 vs. 0.33, 0.06 vs. 0.27, 0.02 vs. 0.26). There were four suicides in this high-risk group, corresponding to a suicide-related standardised mortality ratio (SMR) of 13.7. This contrasts sharply with an expected suicide SMR of approx. 100 in this population. Suicide risk was not related to the recurrence-preventing effect. Conclusion: The reduction in suicide attempts, in both responders and non-responders, indicates that lithium possesses a specific anti-suicidal effect besides its mood-stabilising property.